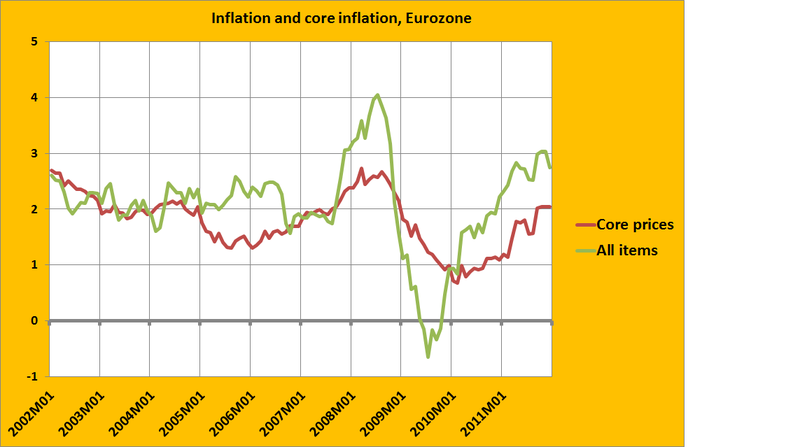 It might become time to add a prediction of core inflation to the ‘flash’ estimate, as core inflation, excluding volatile energy prices, turned out to be a better lode star than headline inflation, after 2008 (graph). This might have prevented unnecessary increases of the interest rate in 2008 and 2011. Draghi seems to understand this. His statements are subtler and less complacent than those of Trichet and he does grasp and defend the idea of core inflation (though he does not mention its name…). Time to change!